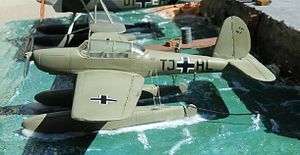 The Arado Ar 199 was a floatplane aircraft, built by Arado Flugzeugwerke. It was a low-wing monoplane, designed in 1938 to be launched from a catapult and operated over water. The enclosed cockpit had two side-by-side seats for instructor and student, and a third, rear seat, for a trainee-navigator or radio operator. Wikimedia Commons has media related to Arado Ar 199. ^ a b Smith, 1972. p. 34. ^ Tilford Jr., Earl (1977). "SEENOTDIENST: Early Development of Air-Sea Rescue". Air University Review. United States Air Force (January - February 1977). ^ Green, William (2010). Aircraft of the Third Reich. Vol.1 (1st ed.). London: Aerospace Publishing Limited. pp. 56–57. ISBN 978 1 900732 06 2. Smith, J R; Kay, Antony L. (1972). German Aircraft of the Second World War. London: Putnam. ISBN 978-0-85177-836-5.